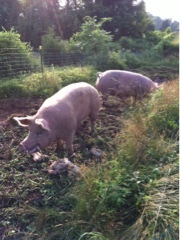 July 23, these 2 massive pigs will head to the butcher. They are large enough that we are not going to do what we usually do, we are doing something different. We will have 3 things made from these pigs, bacon, Canadian bacon and sausage. Nitrate free and smoked over real smoke. In one pound packages that are likely, from our eyes, to fill 3 of our largest coolers and much of our 2 freezers in the commercial kitchen. We are planning on keeping a bit for ourselves, as we have missed all 3 of that pork goodness, and will sell the rest. We expect that it will be perfect timing for BLT's with tomato and lettuce right from the garden. I love to eat. The pork we grow is delicious, and these two are working their way through high grass, eating every bit of it before making mud they wallow in. Then it is on to the next patch. A pigs life. And one that brings tasty meals.